Explore how intercropping can promote soil fertility by increasing crop diversity. 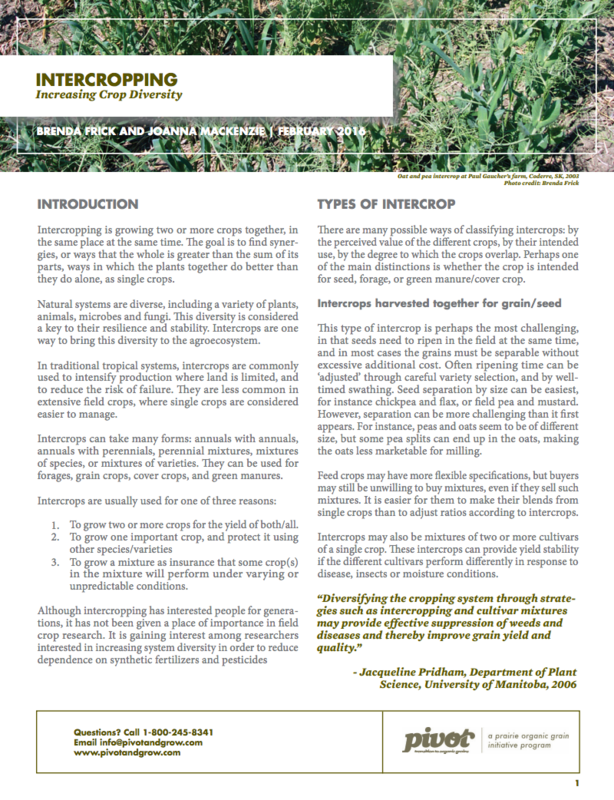 Discover more about the benefits of intercropping practices. Pasture cropping: An integrated approach to grain and pasture production. Cultivar Mixtures, Cover Crops, and Intercropping with Organic Spring Wheat. Agronomic Benefits of Intercropping Annual Crops in Manitoba. Do Wheat Cultivar Mixtures Maintain Yield and Suppress Weeds Under Organic Management. Soil microbial communities and grain quality as affected by spring wheat (Triticum aestivum L.) cultivar and grain mixtures in organic and conventional management systems. The effect of intercropping systems and cultivar mixtures on weed and disease suppression in organically managed spring wheat. South East Research Farm. 2015. Availability of late-season heat and water resources for relay and double cropping with winter wheat in prairie Canada.